While nearly 1 out of 5 Australians live with hearing loss, it remains a poorly understood. Left untreated, hearing loss can lead to a range of social and physiological problems, which include: decreased workplace effectiveness and income; withdrawing from noisy social situations; feelings of isolation; and strain on personal relationships. Scientists have also documented strong links between hearing loss and conditions such as heart disease and dementia. 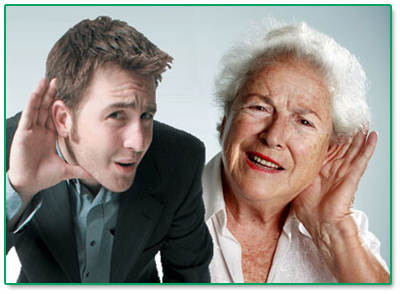 On this page we will examine some of the signs of hearing loss, types of hearing loss and causes of the condition. We also recommend that you spend time learning about how the ear works, which we cover here. While most people believe that hearing loss is an overall loss of volume, for most people this is not the case. As hearing los progresses, it commonly affects different frequencies (pitch) of sound by varying degrees. So while someone with hearing loss can hear someone talking, they actually miss parts of words and conversations. If you experience any of these symptoms, we strongly recommend that you contact our specialists to arrange a free hearing check and consultation. You may also like to take our free 1-minute online hearing tests, which have been developed to help people objectively assess their level of hearing health. The three forms of hearing loss are Conductive, Sensorineural and Mixed hearing loss. While many people put their hearing difficulties down to “just have a build up of wax”, only 10% of hearing losses are conductive in nature. Conductive hearing loss is often treatable and causes mild to moderate in severity. In most cases, hearing is restored after the treatment. The overwhelming majority of cases of hearing loss are sensorineural in nature. Originating in the inner ear, sensorineural hearing loss occurs due to damaged hair cells or nerves within the cochlea. Sensorineural losses are commonly treated through the use of hearing aids or cochlear implants to correct the hearing. Once damage, the hair cells (nerve endings) within the cochlea cannot repair themselves or be medically treated – therefore over 90% of cases of sensorineural hearing losses have no “cure”. Nevertheless, the use of hearing aids is of great benefit to people with sensorineural hearing loss. As you may suspect, this is where a person has a combination of sensorineural and conductive hearing loss. For example, someone with inner ear damage due to long-term exposure to noise in his or her workplace could also be suffering a cold that has led to fluid build up in the ear canal. Many people suffer from a frustrating condition called Tinnitus, which is often related to hearing loss. Click here to learn more about tinnitus and the treatments available. While age is certainly a factor in the development and severity of hearing loss, more than half of people in Australia who suffer from the condition are less than 65-years of age. Studies and statistics have show that around 37 percent cases are due, at least in part, to long-term exposure to noise either through working conditions or lifestyle choices. This highlights the need for people to adopt hearing protection (such as custom fitted earplugs) when working in noisy environments. The statistics also show other causes like, infection or injury at 17%, birth or antenatal loss at 4.4% and all the other causes contribute to 16.8% of hearing losses. Why can I hear low-pitched sounds better than high-pitched sounds? Over time the high frequency hair cell receptors receive more movement by the incoming pressure waves of the fluid inside the cochlea. For this reason, high frequency receptors are more prone to long-term damage than the low frequency hair cell receptors, which are more protected further up the cochlea. If you believe that you may be experiencing the symptoms of hearing loss contact our specialists , it is important to do something about it as soon as possible. The brain’s ability to process sound will continue to diminish the longer that it made to go without stimulation, and this can lead to reduced effectiveness of treatments when people come to take steps to addressing their hearing loss. Additionally, it is important to take steps to prevent the potential social and physiological affects of the condition. Call us or click here to make an appointment for a free hearing check.